The outlook for Libya’s economy remains favorable. Gaddafi has felt the heat of that authority since February 17 when large protests began all over Libya.. Despite a ruthless security apparatus, Libyans had simply had enough. Reports now have the anti regime forces in control of the nation's second largest city, Benghazi. Reportedly, Gaddafi used fighter jets against his own people in the last twelve hours. Aljazeera reports that advertisements are running in neighboring African states offering $2000 a day for mercenaries to augment the ranks of state security forces. The violence against the Libyan people by the government led the Libyan Ambassador to the United States to withdraw support for Gadhafi. The ambassador to India and other diplomats are doing the same. Unlike the former dictator of Egypt, Hosni Mubarak and Tunisian strongman Ben Ali, Gaddafi has no real friends in the White House or European Union. He has cultivated better relations by giving up his weapons of mass destruction in 2003 and supporting the United States invasion of Iraq in the same year. But his history of erratic behavior and state sponsored terrorism are not quickly forgotten. With several major cities in the hands of protesters, only the capitol remains habitable by Gaddafi. That will be lost soon. A just released report tells of security forces deserting the government and joining anti regime forces in and near the capitol. The Guide of the Revolution has nowhere left to go and few willing to accept guidance. Like Richard III before the Battle of Bosworth Field, Gaddafi watches supporters vanish from top to the bottom of his army. His response has been no less brutal than Richard's, with assaults on his own people by hired thugs that he bought in neighboring countries. It will not end well for him, but it will end soon. Did policies of global capitalism light the flame that turned into the Libyan revolution? Privatization, "market" policies, and IMF style financial and fiscal management preceded the Egyptian revolution. Time will tell. One can only wonder what the authors of the IMF Report of February 15 are thinking. It all looked so good to them. Two days later, a regime ending civil insurrection began that will topple the oligarchs with whom IMF had been striking deals. When international financial organizations and "experts" take a liking to a regime, they become blind to the atrocities that the regime has committed. It's all just money to them. Handle the money right and everything will work out. Milton Friedman's shameless and shameful courting of the Chilean dictator and charged murderer, General Augusto Pinoche, set the tone for the open alliances with thugs by elements of the financial community. Friedman and the others who courted Chile must have missed the news about the murder of 3,000 Chileans in the capitol stadium in 1973. Maybe the IMF and the Western nations failed to notice the state sponsored terror by Gaddafi, his violent internal repression, his autocratic rule, and his vast personal enrichment. But what does that matter to the global bankers and financiers. He was cooperating with the IMF, privatizing, he had a surplus, etc. What more could they ask? Ok, so there's more unrest and civil uprising in the Middle East and northern Africa. But, what does it mean to the United States, our economy, oil prices, the value of our currency, American owned businesses, and John Q. Public on Main Street America? Will it ( civil disorder ) lead to possible military action by OUR military, a multi-national security force, the involvement of the U.N., international sanctions, and/or economic aid to support the opposition? Can the U.S. greatly benefit from a "Lybia without Gaddafi"? Does Gaddafi have enough international support to stay in power? 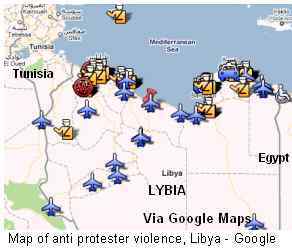 What importance does Lybia have in the region? Aside from oil, is Lybia an important player in the Global Economy? What is the extent of Lybia's influence in the region economically? Should the U.S. be concerned whether or not Lybia has a stable government and economy? We're talking about regime change in two countries, now looking at the possibility of at least 2 others in a very short time period with Libya potentially getting out of the grips of a psycho/dictator who has committed terrorism, war crimes and is a ...psycho for over 40 years. On oil it sure affects the U.S. but more it's contagion of people protesting and uprising. So, officially this does slightly deviate from the U.S. focus of this site but this is so historic, I asked Michael to write about it. And with each of them possibly right into the hands of a new dictator, or a dictator of the mob, or most violent section of the mob. Supporting popular revolt always has interesting and unplanned side effects. Sorry for the delay in responding. In my opinion, the United States and the various international agencies that it uses must operate with integrity when dealing with foreign powers. The dictators that the government seems to like so much end up torturing and killing their own people, stealing money, and, in general, disgracing their allies. That's what is happening now with Libya. The US and UK both touted Gaddafi as some sort of poster child for their rehabilitation efforts. He wasn't and never could have been. I suspect that they know that. In this situation,, the US faces a dilemma - urge the ouster of Gadaffi and incur the negative residue from the US government role in supporting him or support him now and face the scorn of the entire Arab world. It's time to clean up our act to avoid a repetition of events like this in the future where there are only bad choices. While it may be true that we made a bad call in the past, having a little egg on our face doesn't mean big changes here at home. Look at the bad calls we've made concerning Iraq, OBL, Afghanistan, VietNam, Mexico, and to an extent, Russia. Those bad calls did adversely affect home. But, my questions were concerning Lybia and other countries experiencing civil unrest. My point was that at present, we have bigger fish to fry. Sure, Lybia's oil production, or lack thereof, does adversely affect us here at home when the price of gasoline at the pump jumps. But, concerning ourselves with civil unrest and riots in the Middle East and Northern Africa doesn't address the problems here at home. There will always be discontent somewhere abroad, as it has been for centuries, especially in the Middle East. We can't afford the continuing practice of sticking our nose into affairs that basically are of little or no direct benefit here at home. We're presently paying dearly in lives and money for doing so ( Iraq and Afghanistan ). Where's the concern for the millions of innocent civilians slaughtered, massacred, raped, and starved, in some of the African nations over the past decade? Have we sent troops to Africa, imposed economic sanctions, withheld foreign aid, or provided a safe haven for the innocent? In other words, where does the present events in Lybia rank on our priority list? "we have bigger fish to fry"
Depends. Yes, we have much bigger fish to fry as a nation than meddling in foreign affairs. Look what Iraq/Afghanistan cost us. As a people resisting an oligarchic regime, one that pushes everyone down as far as possible to maximize profits, we are frying the same fish. In Tunisia, Egypt, and Libya, the governments all followed the globalism handbook from the IMF and Wall Street: "open" markets, anti union, anti small business. The exact same approach is applied here. It is a common enemy. I see those three countries as the tip of the spear in a global counter resolution against The Money Party boys. In each of those revolutions, one component was, "If the Tunisians, etc. an do it, so can we." Maybe we'll catch on here. It is possible that it'll spread to the U.S.A. one day. We can only hope and pray that it does. I see a citizens' revolt in the U.S.A. an almost certainty, and in my opinion, it won't be that much longer until it happens. We're going down a dead-end path filled with economic ruin and government negligence. But, we have no business concerning ourselves with happenings in the Middle East and Northern Africa, especially at this stage of the game. Our primary concerns should be focused here at home where folks are in much economic stress and misery. To me, putting undue emphasis on matters that do not directly address issues here at home, is very counter-productive, and only serve to distract from and prolong the dire situations and circumstances pushing us further down into the abyss of economic ruin. We can't control the price of oil, civil unrest abroad, over-throw of governments, nor can we take the entire world under our protective wings. We've tried to play the role of "big brother" in the past, and most of us can see the cost in lives and economic damage as a direct result. To me, the Middle East and North Africa falls into the catagory of "nice to know information" at best. We can't do a damn thing about it, have no control over it, can't change the out-come, and certainly do not have the resources to assist either side of the conflict. If one will look at the centuries of history in that region of the world, it's easy to see that unrest is par for the course, especially in the Middle East. The current events should come as no surprise to anyone, especially to those in our own government. It was economists from the Chicago school, not Milton Friedman per say, who went to Chile, although their "reforms" failed, specifically the privatization of social safety nets, it's still touted as a great idea by many, in spite of what actually happened. Also, the sociopathic sort of foreign policy that propped up dictators really started in earnest after WWII. The CIA led Iran coup to put the Shah in place is a classic example. In the piece update on oil, there is a link to The Prize, which goes through the history of oil. Oil and getting control of oil fields, was a major element in WWII. Without oil, one could not win the war. Japan bombing Pearl Harbor was also in part about oil. The U.S. secured a host of oil field, first, part of the reason to enter N. Africa. Cold and heartless as it is, it's still true today, those who control oil, energy, control the world. So, the U.S. has been protecting, promoting it's own economic interests and in my view, much worse, protecting multinational corporate interests for over 120 years. You are absolutely right that the primary interaction was between Chicago School folks and the Pinochet government. To this day, they're defending their efforts. But here's the ice breaker. Pinochet and Friedman had met in person. This was followed by this extensive letter: April 21, 1975 Friedman's advice to Pinochet. Maybe somebody else can find it, but I didn't see any objections to dealing with brutal dictator who had slaughtered several thousand to consolidate his coup. The government does what it's told. Shows who is in charge. It's the ultimate revolving door. These are some great observations Michael! I don't think I've seen any mention in the press, and even the blogs about privatization and globalization agenda, how it is destroying people's nation-states and livelihoods (such as they are in this situation), making Dictators filthy rich to the point the people finally revolt. They stop at "ruthless Dictator" and do not connect the multinational, financial, strategic energy interests of corporations. The IMF quotes are classic. It's all good if someone wants to repress their people as long as they allow Citigroup, UBS and Goldman Sachs into their country? You heard it first on Economic Populist! I couldn't believe that IMF quote. Two days before the uprising, they say that the economy is in good shape. I wonder if they consider the people and their actions a part of the economy. Aren't the Chicago folks big on 'behavioral economics', e.g. Richard H Thaler? So on the 15th, it's all good but on the 17th 'behavior' changes radically and impacts the economy. I realize that this is piling on but it is irresistible. Sounds good, no? The strongman's policies were so "prudent", people started immolating themselves in public squares. It's Medal of Freedom time for the IMF! Of course this is just 2 of 112 different ways to spell his name. I thought all would be amused. I check spelling on proper names often and this is an astounding list. This is truly astounding, if this goes you can bet Iran is next and it will be a bloodbath I suspect. What a message to "the Guide." This is the story of the street vendor who had been humiliated for years, disrespected by the police and bureaucracy, and, after a final appeal, set himself o fire in protest of a miserably rotten system. It's an amazing story, an emerging archetype for what may become Giambattista Vico's "Age of men (people)"
In a country where officials have little concern for the rights of citizens, there was nothing extraordinary about humiliating a young man trying to sell fruit and vegetables to support his family. Yet when Mohamed Bouazizi poured inflammable liquid over his body and set himself alight outside the local municipal office, his act of protest cemented a revolt that would ultimately end President Zine El Abidine Ben Ali's 23-year-rule. Local police officers had been picking on Bouazizi for years, ever since he was a child. For his family, there is some comfort that their personal loss has had such stunning political consequences. And nearly everyday, he was bullied by local police officers. The harassment finally became too much for the young man on December 17. That morning, it became physical. A policewoman confronted him on the way to market. She returned to take his scales from him, but Bouazizi refused to hand them over. They swore at each other, the policewoman slapped him and, with the help of her colleagues, forced him to the ground. Press in Jerusalem reporting Gaddafi ordered security forces to blow up the oil pipelines. I would imagine that even would bring the wrath of corporations. he resigned, joined the rebellion and is now reported "kidnapped" by CNN. This is moving very fast. 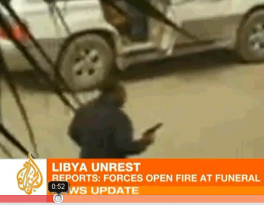 Shooting the people in Tripoli, WSJ. Washington, DC, C-Span Radio, February 23: Masood Ahmed of the IMF Middle East section was just asked what role the IMF plays in crisis in the Middle East, specifically by dealing with corrupt dictators. Ahmed said that IMF was not in the business of telling countries how to govern. But, he said, it is clear that the sustainability of macroeconomic projects (i.e., IMF funding) depended on the people of the nation feeling involved in the benefits that flowed to that nation, having some say in it. This is a far cry from their normal stance and a recognition of the profound error made in the Feb 15 report on Libya quoted in the article. 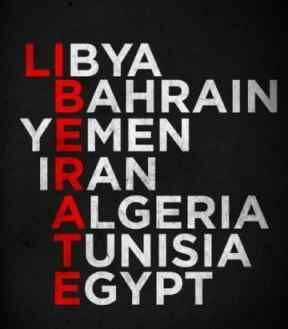 This is truly a major revolution in the Middle East, Libya in particular. Any actual changes in IMF policy will have to be judged on the basis of future behavior. An apology to the Libyan, Egyptian, and all of the other citizens of dictatorships funded and legitimized by the IMF would be helpful, sooner rather than later.